I love making recipes in my slow cooker and just made the most amazing beef and broccoli recipe ever. It takes hardly any time to throw together in the morning and just a few minutes to finish up come evening. You can find oyster sauce in the Asian food section of your favorite grocery store for about $3 or $4 a bottle. 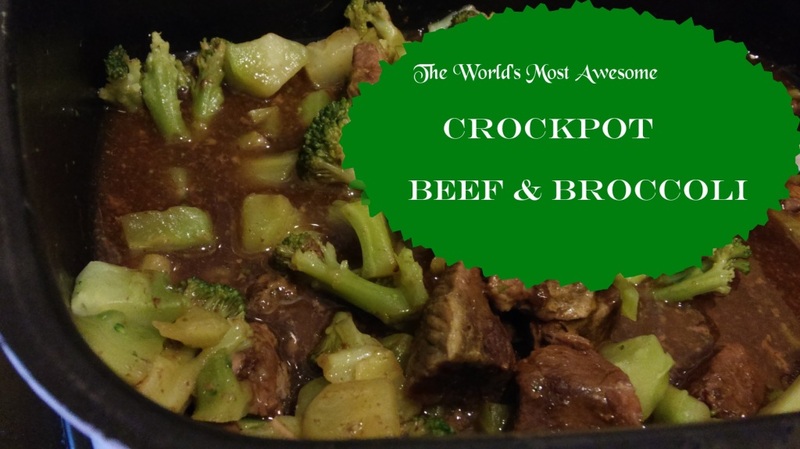 Your family may want to eat this crockpot beef and broccoli by itself or you could serve it with cooked or steamed rice or even boiled egg noodles. As with other crockpot beef recipes, you have a lot of leeway in choosing cheaper cuts of beef or whatever happens to be on sale, since the slow cooking all day in the crockpot will make most cuts of meat tender and tasty. Spray your slow cooker lightly with olive oil and arrange the beef around the bottom. Pour the beef broth and oyster sauce over the beef. Cover and cook on low for six to eight hours. When you’re almost ready for dinner, microwave the broccoli in a small amount of water on high until tender, about seven to nine minutes, depending on the wattage of your microwave. In a small bowl, mix the 2 tbsp of corn starch with 1/4 cup of the fluid from the crockpot and stir until smooth. Add the corn starch mixture to the crockpot and combine, then gently stir in the broccoli. Cover and cook on high for about 10 minutes or until the broth starts to thicken. Making beef and broccoli in the crockpot ensures that you have tender, savory beef, and the resulting sauce is absolutely delicious. Check out more of my Dukan Diet posts here.